Annelie Muehler is an undergraduate student who is about to finish a 2 month internship in our group. She has been working with me conducting psychophysical experiments, and we have been creating stimuli using python. As part of getting used to scientific python Annelie learned to use Pandas, a package that essentially gives you R’s data frames in Python. The following compares the code to do a simple analysis in Matlab and Python. While it’s possible there are ways to improve the Matlab implementation (perhaps using the statistics toolbox? ), it’s noteworthy that these weren’t taught in Annelie’s course. As part of my undergraduate studies in cognitive psychology and neuroscience, I did a water maze experiment in an advanced biology/neuroscience lab course using mice. For this experiment, I had ten mice that did four trials of the experiment over a six day period. The point of this experiment is for the mice to be able to find the platform in the water with increasing speed as they complete more trials. This is because they learn where the platform is. The water maze experiment is one of the behavioural experiments used in mice and rats to test for the ability to learn. Later we used this data while we were learning Matlab in another lab class as a basis for learning data analysis. During my internship at the Centre for Integrative Neuroscience in Tuebingen, Germany, I reanalyzed this data using pandas in python as a way to learn pandas, giving me a direct comparison of Matlab and pandas. There are definitely some very nice things about pandas. First, you are able to define your own index and column names that are shown surrounding the matrix in a format similar to a table in a word processing document or excel file. This was one of the most frustrating things for me in Matlab because in Matlab you have a dataset and then another variable which contains a list of strings that corresponded to the column names so that you can look them up there. An example of the format in which tables are seen in pandas using the mice data. The table is stored in a variable called rdata. 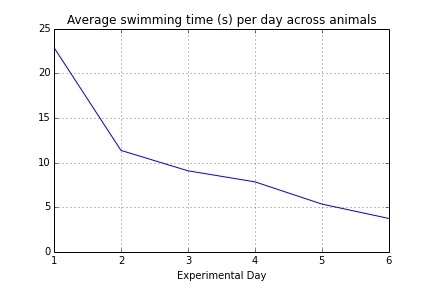 Swimming Time represents the amount of time it took the mouse to find the platform in the water maze experiment. rdata.sort(columns = 'Animal') which sorts the data by a specific column, in this case the column Animal. As you can see above, pandas (and python in general) has object-oriented functions. These work by using the name of the object, in this case rdata, adding a period and then typing the function. This will show you the result of the function but generally not change the actual object unless the object is equated with the function (as in rdata = rdata.sort(columns = 'Animal'). This created a dataset in which the rows for each day were identified. 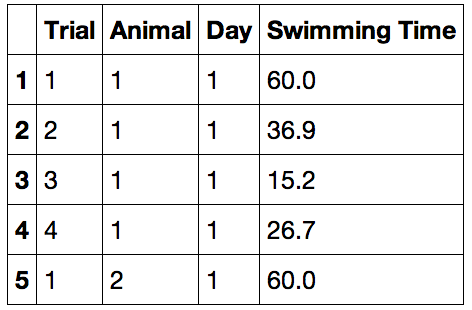 Using the data set from step 1, we are able to get a new data set where the swimming time of each trial is listed for each day across animals. Here’s the same thing in pandas. The usual importing at the beginning of each python script. Groupby is a useful command that will group the data by day (parentheses) according to Swimming Time (square brackets). This eliminates sorting out the rows by day using a for loop as is done in the Matlab code above and allows you to group your data according to different variables in your data frame. The .mean() operator at the end tells pandas that you want to compute the means on the grouped data. Of course this is a very simple example of data analysis, but I think it does outline some of the benefits of pandas. The nicest thing in my opinion is the ease with which you can manipulate the data frame and the ability to select columns by their name. The groupby function is very useful and can be used to groupby multiple columns or to group multiple columns. In my opinion, pandas is a much simpler and convenient way to work with and manipulate data. 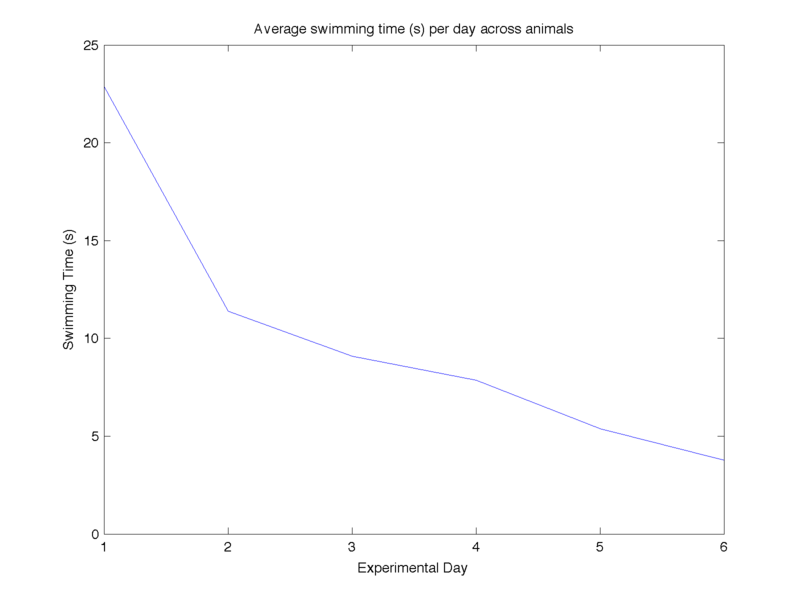 Posted in Guest post, Scientific programming and tagged Matlab, pandas, Python on August 14, 2014 by tsawallis.